Amazon.com description: Product Description: Are you looking for high-impact, research-based strategies to transform your students into high-achieving and inspired learners? In The Strategic Teacher, you?ll find a repertoire of strategies designed and proven to meet today's high standards and reach diverse learners. Twenty reliable, flexible strategies (along with dozens of variations) are organized into groups of instruction. To guide teachers in delivering content to students, the authors started with the best research-based teaching and learning strategies and created a tool called the Strategic Dashboard. The dashboard provides information about each teaching strategy in a concise, visual profile; it is also designed to document how you incorporate current, highly respected research into your plans. The authors have combined their years of research and practice to deliver reliable, high-impact, flexible teaching and learning strategies grounded in current, highly regarded research to teachers at all levels of experience. 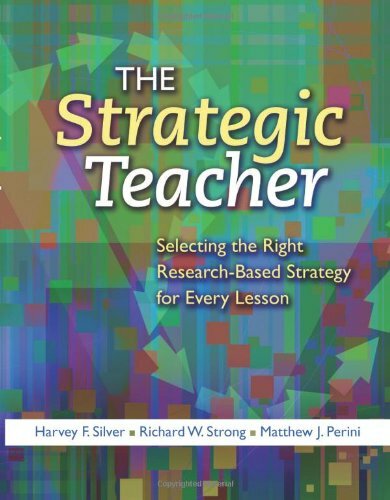 With Richard W. Strong, Matthew J. Perini | 1 edition from Prentice Hall (May 12, 2008); titled "The Strategic Teacher: Selecting the Right Research-Based Strategy for Every Lesson"
About: The Strategic Teacher offersÂ a repertoire of strategies designed and proven to meet todayâs high standards and reach diverse learners. About: Are you looking for high-impact, research-based strategies to transform your students into high-achieving and inspired learners?